At the beginning of this year, we received a long email from Elina, who expressed her dissatisfaction with the digital tools offered by the manufacturers and the SSIs to help the design offices to analyze and put a cost on technical specifications. We decided to publish it as is. So, do not hesitate to react by posting a comment in the dedicated section below! 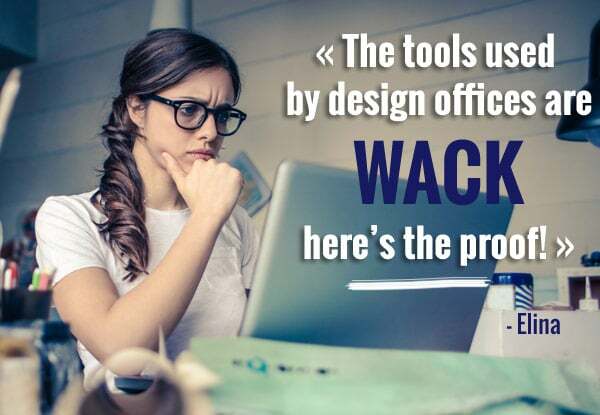 The tools at our disposal as a design office are mediocre! And I don’t think I am an isolated case. In order to demonstrate this statement the best that I can, I’ll explain how I work on my projects and point the loss of time and money generated by these tools at every step. First, I start with understanding the whole project in order to comprehend the specificities. At this stage, my skills and sharing with other colleagues is my only support. When the building type is similar to a previous project, I use these former plans and I make changes. No tool on the market allows to start from a basic configuration or a type of building in order to customize it afterwards. By using previous projects, we increase the risk of human errors. For this part, either I work with a generic calculation tool like MagiCad, or I use manufacturers’ tools (XLPro, Simaris) to be more precise on the compatibility and the way I should define the equipment. Some new building projects may have types of electrical equipment that require special electrical or mechanical circuits that only serve certain types of equipment. In this case, only tools from the manufacturers can guarantee compatibility and a choice adapted to the project. For instance, our network expert uses tools like HPE Proliant. Once all equipment is defined and calculated, I am committed to complete the whole design of the project and write the details of the spec. Usually, I use a previous project to complete the structure of the specifications; tools like EcoDial not covering all chapters. We have to manage different tools that are either not compatible and therefore force us to redo the work several times; either too specific and therefore related to one part of the project only. Today, we’re in the midst of a change in our profession, which – if you grant me – will facilitate our work when everyone is well trained. The arrival and democratization of BIM didn’t solve anything since, unfortunately, not all manufacturers provide enough data. If you work with tools like TraceSoftware, you save time during the design stage and the file transfer to your next suppliers. On the other hand, the data are either rare or poorly presented and you have to go hunting for information, libraries and useful features. The same applies to projects for which we’ve obliged to take the building’s energy performance into account. Loss of time and money: lack of data, resources, documentation, etc. No tool offers different solutions with architectures you can choose by level of efficiency and by investment cost. However, in our business, we must be more efficient and deliver a solution that fits into the budget while being deliverable in time. Therefore, when I have to study a project and its specific aspects, I can only rely on my qualifications and on the opinion of the members of my team. This is a real waste of time and I have no other options! This is it, so what do you all think? Are you in the same situation as Elina? If so, could you please tell us about your issues in the comments? What tools or features are you currently missing? Do you know about solutions or methods to meet Elina’s expectations and probably many other engineers’? Thank you for reading and especially for your comments. or copy this trackback: http://engineering.electrical-equipment.org/others/tools-used-by-design-offices-are-wack-heres-the-proof.html/trackback from your own site. We are in the process of trying to solve some of the issues you mention. drop me a note at my linkedin profile and I can share what we are working on to address your points. Nu sunt de acord! Situatia este creata tot de noi si de modul nostru de abordare a problemelor. Energia in general, si cea electria in special, merita atentie si munca sustinuta, de cand s-a inventat si pana in prezent omul nu a reusit inca sa inteleaga absolut tot despre acest fenomen fizic. Personal am studiat aceasta latura a existentei la politehnica din Bucuresti si am avut norocul sa lucrez pana la anii de pensionare in domenii strans legate de energia electrica. Pot spune ca datele existente pe plan international privind documentarea stiintifica in acest domeniu sunt destul de bogate, diverse si bine explicate. Problema noastre ar fi cine cauta aceste date, unde le cauta si cat de interesat este sa le gaseaca. Cu parere de rau sunt nevoit sa o contrazic pe Elina, insa doresc ca textul meu sa fie un indemn de a continua si mai ales de a insista si a da atentia cuvenita diverselor proiecte. Energia vine din natura, iar natura merita mult mai mult de la noi, singura specie cu discernamant si educatie de pe planeta. I don’t agree! The situation is created all of us and our way of approach. The energy generally, and the electroy in particular, deserved attention and the work supported, since it invented and so far the man has yet to understand everything about the physical phenomenon. Personally, I studied this side of the existence at the bureau Polytechnic and had the fortune to work until the years of retirement in tight areas related to electricity. I can say that the existing data on the international scientific documentation in this area are quite rich, various and well explained. Our problem would be who’s looking for these data, where they re looking for them and how interested it is to find them. With the feeling of evil I have to argue with Elina, but I wish that my text was an urge to continue and especially to insist and give attention to the various projects. Energy comes from nature, and nature deserved much more from us, the only species with superior raties and education on the planet. Thank you Thoai for your answer. how you decide what tools you use from manufacturers? what are the one useful that I could use myself? Thank you to support me. Actually all the points/observations raised by Elina can not be solved by one tools. It can be addressed in different tools like Ecodial, Simaris, Acad etcc. To address all the observations in one tools can be done but at the moment not possible. Dear Saeed, I agree with your comment and with Elina headache as well. As you said you use different tools, how you decide to use them? by project, by application…? I generally use always the same. what about you? I agree with Elina, but I am afraid there is no adequate solution yet. In my opinion, every software manufacturer protects its own product and will therefore avoid an open structure. I think imposing an open export protocol would be a first step. There is for sure some room for improvement on the matter. As a step toward an enhanced value proposition, Schneider Electric has published and made available for free (for now ;-) some electrical distribution design guides that can help speeding te design process. They can be found on Exchange, the newly launched platform for collaboration and co-development and innovation: https://goo.gl/WfEFyp. Indeed the software on the market does not make it possible to realize a complete project with only one software. It must be recognized that each project has its own specificity and it is difficult to find a single adapted software. I use SCHNEIDER software, my experience and that of my professional entourage. Thank you Pierre. Agreed each project is specific, even if some parts are similar. why do you use the same manufacturer, are you able to cover all the project even if one tool doesn’t exist yet. My concern is the compatibility between each manufacturer. I use ElectricalDesign from Tisoft. I am KAKULE TSONGO JEAN from the Democratic Republic of Congo and I am so interested by this forum.